WELEDA Frequent Use Organic Shampoo with Millet cleanses gently your hair while preserving their natural shine and strength. Millet extract rejuvenates, macadamia oil smoothes and officinal sage stimulates your hair and scalp. Its gentle formula is perfect for all the family on the daily use. 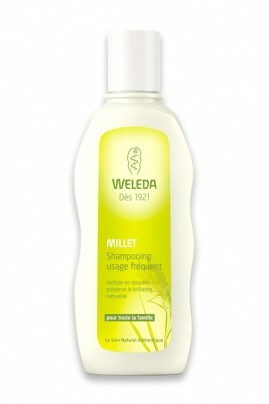 You will love the fresh fruity scent of Weleda Natural Millet Shampoo ! No synthetic conservative, synthetic colorant and synthetic fragrance. No sulfate, no mineral oil, no silicon. Apply Weleda Frequent Use Organic Shampoo on wet hair, massage then rinse. Dermatologist tested. Water (Aqua), Disodium Cocoyl-Glutamate, Disodium Coco-Glucoside Citrate, Sodium Lauroyl Oat Amino Acids, Alcohol, Glycerin, Xanthan Gum, Fragrance (Parfum)*, Glyceryl Caprylate, Sodium PCA, Panicum Miliaceum (Millet) Seed Extract, Macadamia Ternifolia Seed Oil, Salvia Officinalis (Sage) Leaf Extract, Lactic Acid, Sodium Cocoyl Glutamate, Sucrose Laurate, PCA Glyceryl Oleate, Arginine, Sodium Phytate, Limonene*, Linalool*, Citral*, Coumarin*.